Adjacent to the gorgeous Rocky Mountains, you will find the splendid community of Lakewood, Colorado. Lakewood is nestled in the foothills, so the mountains do not make it difficult to travel around the area. 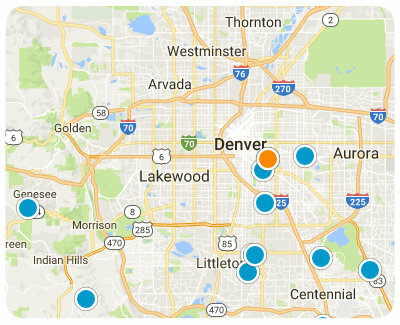 Home to over 142,000 residents, Lakewood is also in close proximity to Denver and the two are well connected via numerous major highways. No matter how you prefer to spend your time or the size of your family, Lakewood is the place for you. Families with children considering relocation in Lakewood will be excited to discover the schools here are of the highest quality. There are ten public high schools, five middle schools and numerous elementary schools strategically located throughout the area. Lakewood also boasts private school options and schools for children with special needs, in addition to having multiple colleges and universities. The opportunities for outdoor recreation here are seemingly endless. Residents enjoy backpacking, camping, fishing and hiking during the summer, as well as snowboarding and skiing during the winter. Additionally, Lakewood has over 7,000 acres of parks and open space, as well as 80 miles of hiking and biking trails. For those that prefer to be indoors, there is still plenty to do in this remarkable city. Throughout the year you’ll find concerts, plays and other performances, as well as community events and festivals to entertainment people of all ages. There are also multiple art galleries to visit, and The Lakewood Heritage Center, a museum preserving the city’s history, to enjoy. Shopping opportunities also abound at Belmar, Colfax and Wadsworth, as well as Colorado Mills. This walkable city is easy to traverse and is on the Denver metro system. Additionally, it is only forty-five minutes from the Denver airport. With all of these fantastic amenities and features, Lakewood is a must-consider destination for homebuyers searching in the Denver Metro Area. Homes for sale in Lakewood are of varying styles and sizes and come in a very broad price range. If you would like information regarding the real estate of Lakewood, Colorado, please allow us to assist you and contact us today.